The ivory-white marble mausoleum was built by an emperor in memory of his late wife. Built on the south bank of the Yamuna River, the Taj Mahal is one of the seven wonders in the world. Its striking beauty, breathtaking vistas and romantic history make it world’s most lovable monument. Now this almost brought in World War III as Stefan wanted Sebastiento do the same from for him. The monument has a fascinating history which is a dream for any lover from their beloved. It is this history which makes Taj Mahal even more wonderful and appealing. 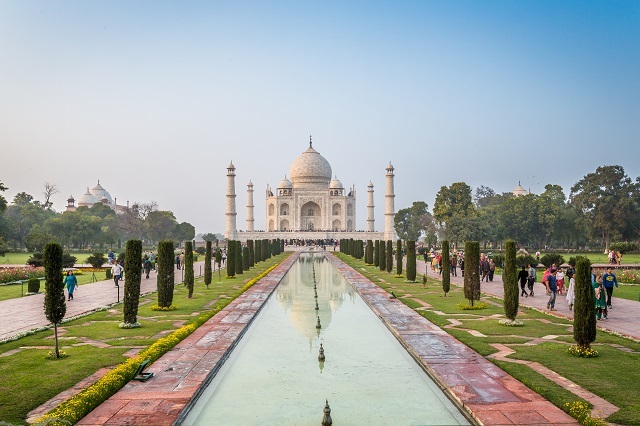 Our visit to Taj Mahal was part of our “Golden Triangle” triangle tour. Golden triangle refers to the three cities (Delhi-Agra-Jaipur) of North India. We reached Agra by an early train from Delhi but the track was not all rosy. As the train takes you through the narrow lanes which are lined by slums, you see so many people excreting out in open on railway tracks. It was almost like travelling through a huge open toilet with so many squatting bums. Ironically, one of the world’s most beautiful monuments is based in a city which is as dirty as the open toilet we descried earlier. There are a number of open sewers running alongside the roads in Agra. The city looks ruined and dirty as the piglets roam around lazily. However, there is no denial to the fact that the monument looks more beautiful than in pictures. It was our first rickshaw ride in the city and we carried a lot of prejudice as we had heard that the rickshaw pullers in Agra are extremely annoying. Contrary to all that we had a lot of fun during the ride. During our tour to North India, our dear friend Andrew visited us from London. We toured together for two weeks and it was a great fun. Andrew was almost like one of the seven wonders in a country like India as he is as tall as 195m / 6ft 5 inches. To roam around with such a tall friend in the city of Taj Mahal was a sheer pleasure.